Approx length 18 1/2", pendant 2 1/2" X 1 1/2"
This beautiful piece of two color soft green and rust colored jade is carved on both sides with a different design - Chinese script on one side and the Chinese dragon on the other. This makes the necklace reversible. The jade is wrapped in 18k gold vermeil. The artist who carved the jade used the natural two colors to emphasize the design. 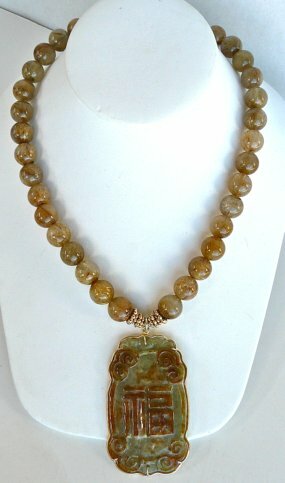 I have beaded the jade with a golden brown rutilated quartz that is varying shade of clearness with the crystals inside the bead showing more in some than others. It is finished with a 18k gold vermeil clasp. This Asian inspired one-of-a-kind necklace is a beautiful piece to wear as well as a collector’s item. The dragon is the imperial emblem of the Emperors in China, especially from the from the Han period where their coat of arms shows two dragons fighting for the fiery pearl. The dragon is a supernatural creature and is the symbol of power, strength, wisdom and goodness. It represents the utmost in accomplishment: good luck and a successful life. It is also believed to be the guardian of hidden treasures. It represents the spirit of growth and change. The bat is symbolic of happiness, good fortune, prosperity and longevity. When something is portrayed upside down it means it has arrived, so the common portrayal of an upside-down bat is symbolic of good fortune that has arrived. It is one of the best symbols of good luck. Two bats together means double good fortune. Rutile is a major ore of titanium, which is a metal used in high tech. It often forms needle-like crystal inclusions inside quartz, known as rutilated quartz. It has the appearance of tiny hairs or granules of embedded gold or other colors which give it the color. It can be dense with these inclusions or clear where the inclusions add little color. Rutilated quartz has been called Cupid's darts.